Mikey's mama bit a human so was killed. EARS gave a home to Mikey, her baby, pictured above! Mikey is doing wonderfully at EARS. Check out Mikey's new video! 2012 Kozy Bear on left. Mikey with his face in bucket. Kozy seems to be saying, "I know, I know. He's young yet." 3/17/2010: Kozy Bear is by far the most rambunctious bear to call EARS her home. Kozy Bear was confiscated from a rather abusive situation, however she can be assured that she will now live out her life with all the comforts her human caregivers can possibly give to her. Kozy Bear arrived at the sanctuary with a terrible declaw job. On her right, front paw, two of the remnants of her claws are visible on the top of her paw. One can only wonder how a human could ever inflict such mutilation upon an innocent animal. 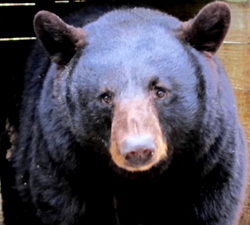 Two one year old bears were placed with EARS by FFWCC. It was determined by FFWCC that Ruby nor Adam were not releasable back into the wild. RUBY & ADAM Enjoying Their Pool! RUBY:"TIMEOUT! WRESTLERS TO YOUR CORNERS!" ADAM: " Mine's gone. Now where do I go?" Florida Black Bear Enjoying His Swim! My brother? Oh, I'm sitting on him, Don't worry, I'll let him come up for air.